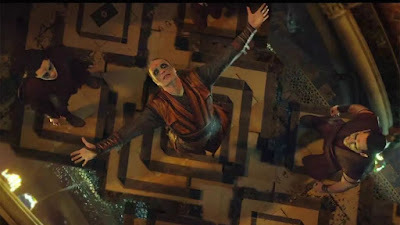 In Doctor Strange, a gifted and wealthy surgeon, Stephen Strange finds his life turned upside down after a terrible car accident that leaves him badly injured and with his career ruined in the process. Upon hearing about a guru who might be able to help him, he travels to Nepal only to be thrusted into a world of magic in which he has to somehow reluctantly takes centre stage, again those who wants to unleash the forces of darkness on Earth. There are some who lamented that recent Marvel films were becoming samey, since Avengers - Age of Ultron and Captain America: Civil War pretty much featured most of Marvel characters seen on screen so far, and there were concerns that this was the shape of things to come. No such concerns with Doctor Strange, which is a single origin story, with a lot of similarities with one of Marvel's earliest and most successful screen character, Iron Man, with he characters progression following the same arc. 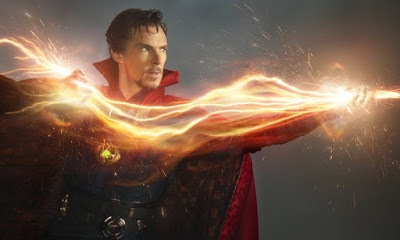 Yet Doctor Strange was also a tricky character to import in the existing MCU, and an important step in the development of its universe, brushing with magic again like the Thor films, whereas most others rely more on science fiction, and the film is very successful in that respect. Director Scott Derrickson (The Exorcism of Emily Rose) has the skill to make you accept this world of spell and multiverses within a contemporary setting without it ever feeling jarring. The mind-bending visuals that he conjures set Doctor Strange apart, and they are just as awe-inspiring as what the trailers teased, without ever feeling gimmicky. From the crazy opening scene, with a fight taking place in folding buildings, to Doctor Strange astrally projecting into multiverses, they demand to be seen in the biggest screen you can, and particularly IMAX (although not if you have motion-sickness!). The special effects are endlessly inventive and push the limits of modern special effects. The last act is also a visual treat and a nice riff on the usual increasingly massive destruction finales in the MCU. As for the supporting cast, it is a mixed bag. Rachel McAdams is given very little screen time and her character could have easily been edited out of the film, a crying shame considering her vast talent. Chiwetel Ejiofor seems to struggle to settle into the part of Baron Mordo, Doctor Strange's sidekick. Tilda Swinton however, as The One, is great fun and just as other-wordly as ever. Mads Mikkelsen as the baddie, is the real stand-out however, no mean feat considered how barely fleshed out his character is (and Marvel often has an issue producing memorable villains, aside from Loki). As Kaecilius, he is broody, menacing and being never less than captivating.